We understand how confusing an insurance claim can be, which is why we've taken some time to go over what you can expect from the process! 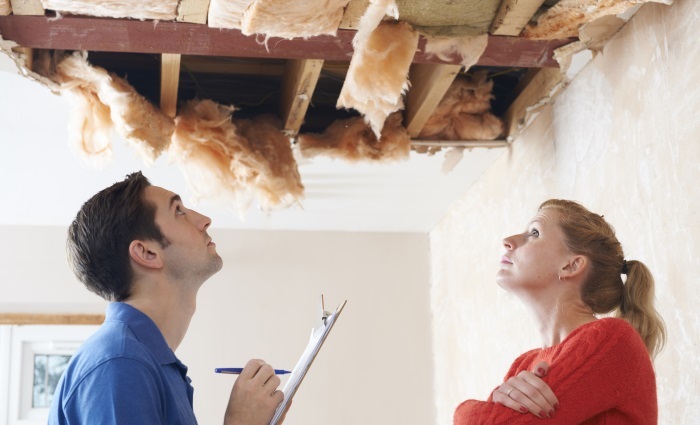 An insurance claim can be extremely stressful and confusing for homeowners. You may not know what to expect from the claims process or what you should do next. To make matters worse, an increasingly understaffed claims force can’t lead you through the process like they used to. This is where companies like Disaster Blaster come in. Understanding both the claims process and the emotional impact a home insurance claim can have on you and your family allows us to provide the support, claims experience, and empathy that you need and deserve. When something like a pipe break, sink overflow, or roof leak occurs, your first priority should be to stop additional damage from occurring. Turn off the water, place a bucket under leaks, mop up puddles where possible. These steps can greatly reduce the extent of damage and prevent damage from extending to other areas of your home. When you contact your insurance company to report the claim, be as accurate and specific as possible in describing what happened and what is affected. We’ve seen instances where covered claims were erroneously denied because a homeowner described a “pipe break” as a “flood”. These mistakes, while minor foibles on the part of the insured, can create unnecessary delays and frustrations. When speaking with the claim representative, clearly explain where the water came from (pipe break, toilet overflow, roof leak) and where the leak occurred (basement ceiling, 2nd floor bathroom, master bedroom). This not only prevents errors in the classification of your claim but ensures that your adjuster or claim processor has accurate information. Depending upon your insurance company and their claims handling processes, some carriers may elect to send an insurance adjuster out to inspect your property and some may not. Regardless of your insurance company’s choice in this regard, you are permitted (and in fact expected) to immediately hire a mitigation company to prevent further damage that may result. Your insurance company may offer or encourage you to allow them to hire their preferred vendor / contractor to perform work at your home. These contractors agree to perform work below market costs and are generally the least qualified contractors in your area. By law, you are permitted to hire a mitigation company or contractor of your own choosing to perform the work on your home. Hiring a Mitigation Company - Look for a contractor that works with insurance companies and understands the claims process as this can greatly simplify the process for you. Qualified mitigation companies should have a good rating with the Better Business Bureau and experience dealing with the type of claim you are experiencing. Additionally, with the number of older homes in Northeastern PA, mitigation companies should be licensed by the State of Pennsylvania to recognize and Abate Asbestos. Your insurance company recognizes the importance of immediate response for water mitigation and drying services and will not require estimates beforehand. An experienced mitigation company can contact your insurance company and receive immediate authorization to take the necessary steps to prevent further damage and begin the process of drying out your property. Hiring a Contractor - Similar to hiring a mitigation company, you want to hire a contractor that works with insurance companies and understand the claims process so that they can submit necessary claim paperwork, estimates, and supporting documentation as will be required by your insurance company. Hiring a contractor that is not able to do this can dramatically delay the repairs necessary at your home. When choosing a contractor to complete the repair work, always look for a contractor that has experience performing the specific repairs that you need. For example, if you have roof damage, hiring a contractor that specializes in roofing ensures that the work will be done correctly and in accordance with state and local code requirements. Working with a mitigation company or contractor that understands the insurance claims process will streamline the billing process. Not only will they know what billing must be submitted when and what supporting documentation may be necessary, but they can help you navigate the process of submitting personal expenses (additional living expenses, meal or hotel expenses, additional utility costs) and requests for replacement of damaged content items. Mitigation Billing - Your mitigation company should prepare a final billing after the work is completed that details what was necessary. They will submit this billing directly to your insurance company for review and payment. Repair Billing - After the mitigation services are complete and the extent of repairs is known, your contractor will be able to submit an estimate of repairs to the insurance company for review. Once your insurance company has approved the estimate, the contractor will be able to begin the repairs at your home. Your insurance adjuster will likely release a partial payment once the estimate has been approved so that you can take care of deposits necessary to have the work begun. Once the repairs are complete, your contractor will submit final billing and supporting documentation to the insurance company for the release of the remaining payment. Additional Living Expenses - Should you find that your home is unlivable or you’re unable to use your kitchen, you are able to request that additional living expenses such as hotel costs and meal expenses be reimbursed by your insurance company. Other costs that you may be able to submit for reimbursement are utility costs, such as electrical or water costs above and beyond what would be normal for you. Damaged Content Items - Did the pipe break directly over your sofa? Did your desk warp or buckle? These items that were directly damaged by the claim itself are able to be submitted for replacement by your insurance company. Depending upon the item, they may wish to see receipts for its purchase or the purchase of its replacement, pictures of the item or its tag / serial number, or a detailed description of the item from its manufacturer or a retailer that still carries it. The checks received from your insurance company can be very confusing. Often, they don’t detail specifically what they are in payment of, only referencing the coverage it was paid under. A check that simply states “payment under dwelling” is not particularly helpful to the average homeowner. To make things even more confusing, checks received may not match up to the amount of your mitigation company or contractor estimates or billings for various reasons. Your insurance adjuster may have taken your insurance deductible from the payment, they may have reduced the pay out by recoverable or non-recoverable depreciation ( what is depreciation? ), and they may have short paid the billing for some erroneous or arbitrary reason. This can make understanding the checks received rather confusing. More about understanding your insurance claims check. If you ever have a question about what a check is for, don’t hesitate to ask. If you’ve spoken with your adjuster and still don’t fully understand, your mitigation company or contractor should be able to figure out what the payment was for or review the matter directly with your insurance company. An insurance claim can be extremely confusing for homeowners, which is why it’s so important to have someone that’s able to help you through the process. At Disaster Blaster, we understand this and that is why we work with our customers every step of the way. Should you ever have a need for one of our services, please do not hesitate to Contact Our Offices! We’re always happy to help!